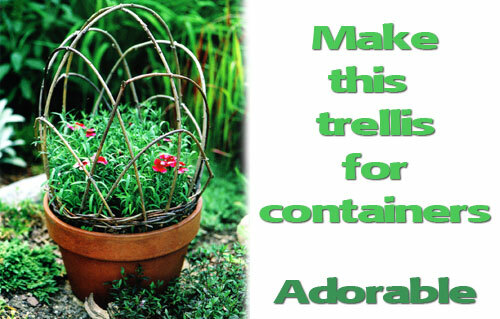 A Trellis Hoop For Any Planter!! When these willow cages are set into terracotta pots and planted with colorful flowers, they provide a focal point all season long in your garden or patio areas. This cage takes about 2 hrs to make, and all the materials are easy to come by. Give it a go and let us know how you did. Pencil thick willow switches make up the hoops. You will need two 42" long, four 36" long and four 26" long. The cage looks best when it is a bit taller than the pot it sits in. The measurements here are for a 11" terracotta clay azalea pot, which is wider than tall. It also has nearly vertical walls, which help the cage sit in it snugly. Peel the leaves and snip off the side branches from the switches. Cut the two best looking 42" long for the main hoops. Cut four thick switches 36" for the middle and found 26" for the lower. Mark the inside of the pot at the 12 o'clock spot and again at 3,6 & 9 o'clock spots. Put the two main hoops inside the pot at right angels to each other so that each end sticks 3" into the pot. Use a twist tie to hold the marked centers together. You can tape the inside of the pots to hold them together. Then curve one of the middle hoops and place the ends on each side of one of the main hoops. The top of the curve should rest about 1/3 of the way down outside the main hoop. The lower hoops are placed in the same way. To make the cage more stable weave the lower hoops in front of and behind the middle and main hoops where you can. Fasten the remaining intersections with twist ties. Traditionally these cages are planted with carnations but many different types of plant materials look good in them. Try to select plants that bloom for a long time or that have nice foliage over several seasons. You can always plant bulbs in them and they look fantastic. Place the pots on a patio or deck, or even in a mixed garden border. Stick them right into the bed. These are easy to do and lovely once made.